Welcome to the Facebook Marketing Strategy series in which we share the best practices for how to use Facebook for business! This is part 4 of the series. 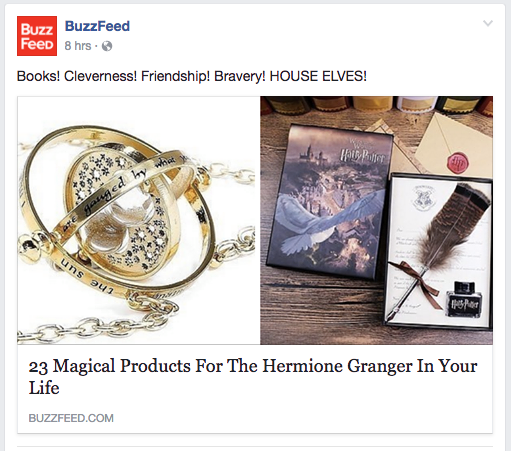 You may have mastered website headlines, but Facebook headlines are a different beast. 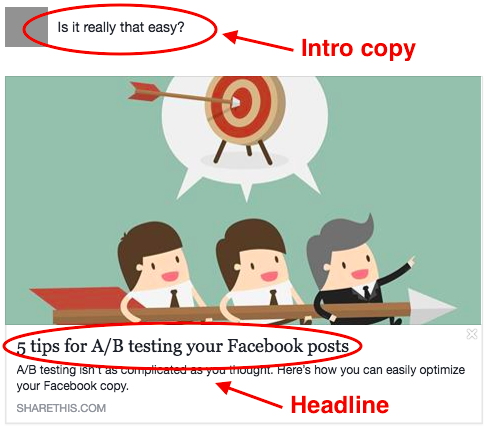 Knowing how to write great Facebook headlines and doing A/B testing is crucial for the success of your post. Even though your headline may be further down, it’s still an important part of your post. It’s the biggest and boldest text within view, and it invites readers to learn more. That’s why you need to make sure your headlines are as engaging, informative, and clickable as possible. Here are five tips to help you do just that. Your headline should tell readers what they need to know as quickly as possible. Tease your content, pique people’s interest, and then get out. For ads, Facebook even recommends writing headlines that are 25 characters or less. 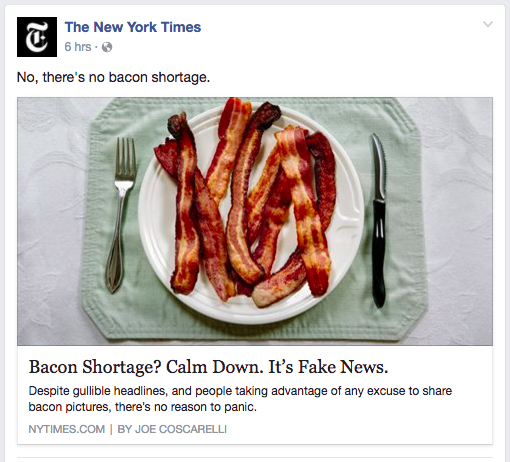 Just look at The New York Times. The storied publication is known for its simple and straightforward headlines. And this translates to success on Facebook. Remember that you can always add more information in your intro copy and description. Use your headline to initiate the narrative, not to tell the whole story. It’s no secret that list posts perform well. They’re straightforward, easy to digest, and fun to read. What many might not know, however, is that odd-numbered list posts perform better than even-numbered ones. At least that’s what BuzzFeed’s Head of Data Science concluded. And with over 200 million monthly readers, BuzzFeed knows a thing or two about audience growth. Over on Facebook, the publication’s five most recent list posts are all odd-numbered. If you’ve been publishing “top 10″ lists, try sharing a “top 9″ or “top 11″ list on Facebook, and see if your engagement increases. Headlines shouldn’t just make a statement; they should start a conversation. Begin this dialogue by posing a question to your readers. 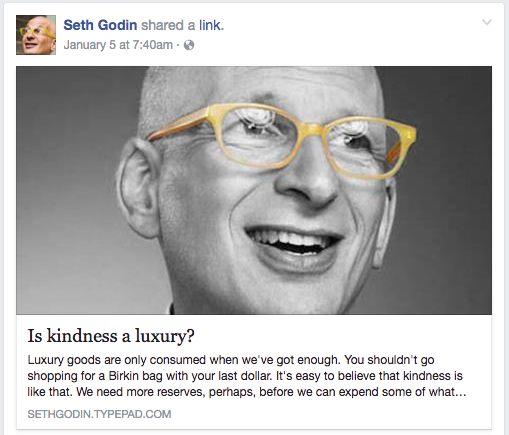 Marketing guru Seth Godin‘s Facebook headlines are a brilliant example of this. All of the headlines for his blog posts are short, sweet, and shareable. And many offer a question to his audience. It doesn’t sell a fancy product. It doesn’t claim, “You won’t believe what happens next!” It simply starts a conversation, and lets the readers do the rest. NewsWhip released a list of the best Facebook publishers of 2016, including The Huffington Post and The Washington Post. What do their headlines all have in common? They tell it like it is. They don’t trick readers into clicking, only to let them down with underwhelming content. 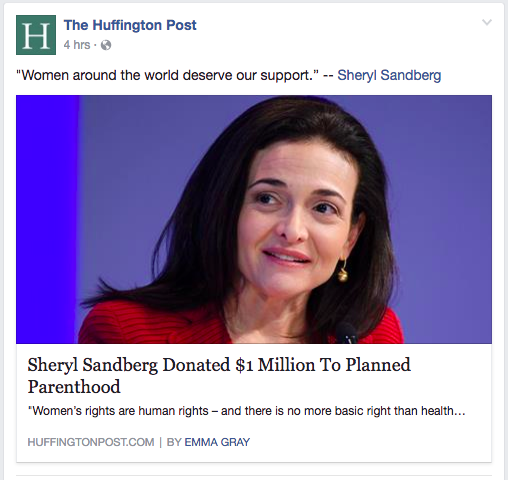 It could’ve been, “You Won’t Believe What Sheryl Sandberg Did!” or “Which Organization Got $1 Million from Sheryl Sandberg?” Instead, The Huffington Post simply introduces the story and lets the viewer decide if they want to learn more. This headline may not be as sensational as those other options, but it is more respectful to the reader, which is far more important. With so many different tactics to try out, it’s tough to know just which ones will work best for your business. That’s why it’s important to test your ideas with your audience and optimize accordingly. We’ll then run the variations to a sample audience in your News Feed and identify the best one. With this tool, you don’t have to guess whether your audience prefers headlines with questions or numbered lists. You’ll just know. You can then run the variations to a sample audience in your News Feed and identify the best one. Put yourself in the driver seat and start A/B testing your content for Facebook. Try our Social A/B tool now to find your most engaging headlines. It takes you less than a minute to sign up and it’s completely free — so why not take a spin?